a. Intake fees are for services rendered, are non-refundable, and I agree not to contest this charge. 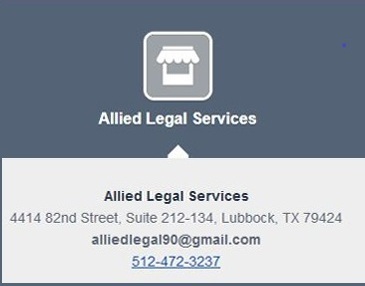 b. I realize that as a basic member, the ATTORNEYS that work with Allied Legal Services WILL oversee the assistance I receive. I realize that Allied Legal Services itself does not practice the law and I must not depend up Allied Legal Services itself for legal advice. c. I understand that I shall be in control of my case at all times. d. I know that the information I receive from others is just an opinion and that it is up to me to research the opinion to be sure that any action I take, truly, will be in the best interest of my children. e. I am not a member of any state, county, or city bar association. f. I will not hold Allied Legal Services, its members, or officers liable for the outcome of any court action I pursue. g. As a member of Allied Legal Services, I hereby agree that I will not be guilty of practicing the law without a license. h. I realize that donations, membership fees, paralegal fees, and any other fees, are non-refundable without written approval from the Executive Director and that any possibility of a refund will be always and only at the discretion of the Executive Director of Allied Legal Services. I agree that all payments made for clients to Allied Legal Services are for services rendered and I agree not to contest this charge. i. I understand that Allied Legal Services reserves the right to refuse services to anyone if deemed necessary. j. I agree that this document is a contract, that I have read it, and understand it and affirm the same with my check in the selection box below which should be viewed as if it were my signature below and that if I should bring suit against Allied Legal Services, its members, or officers, I will indemnify Allied Legal Services, its members, or Board of Directors, corporately and individually, regardless of the outcome of the litigation. Any suit in regard to this contract will be filed and pursued in Caldwell County, Texas, unless Allied Legal Services, its members, or officers, agree to or prefer a different venue and/or jurisdiction. I understand that ALS advises me to study and research the law as it pertains to my case and my family. k. I understand that I have the option to request an email before paying to verify precisely what I expect to receive from ALS in return for my payment and that this MEMBERSHIP AND PAYMENTS TERMS AND CONDITIONS and any emails I receive from ALS prior to my payment constitute my agreement with ALS rather than the information on their website which may not be up to date. l. I understand that I may pay to use an attorney and paralegal assistance through ALS but that I must represent myself in court, hire an attorney at ALS separately from the service, or hire any other attorney. My membership fee does not “buy” me the services of having an attorney retained to represent me in court. m. I understand that my basic membership fee does not pay for an attorney to appear in court for me or be my attorney of record. Directions on how to get help now or to make any type of payment. To get started we need to talk with you by phone first. If you need it we can very easily put your group (relatives, friends, etc.) on a conference call to save everyone time. Also try to have all information about the issues available, especially copies of related court files it they exist if you need help knowing what you need or how to get it we can help you with that. We can often talk for about 15-20 minutes for free after that we can both decide what's next. After that if you need alot more time with us by phone just to know what's going on and what your options may be, you may or may not need to pay a reasonable Intake/Assessment fee depending on our first chat with you by phone to determine that. Most people are able to get all info they need within that 20 minute free time. If desired we can email you a SQUARE invoice so you can pay with a debit or credit card. This is done by you clicking on the link in the SQUARE email invoice that can be sent to your email inbox. Why an assessment fee? For 15 years we got by with free assessments. But now our call volume is too high and the culture has changed. Many people who call now want more than free help assessments but never to pay a dime for the help. Unfrotunately we just have to limit our free time on the phone with people. Also if you start somewhere else and get you case all messed up it likely will cost you more later to get things straightened out. Almost without exception this assesment will be very helpful to you wheather you diecide to use our service or not. It should be very informative and helpful. Ask yourself this question: What's it worth to me to get quality help? Pricing can vary depending on a number of factors so please make sure you speak to our staff before paying. Call for details and assistance. Again please always speak with a staff member by phone to help you know the exact amount you want to pay before you make a payment of any kind. Prices can vary based on a number of factors. IGNORE THIS CREDIT CARD PAYMENT SECTION FOR NOW JUST CALL THE OFFICE FOR Credit Card or Debit Card payments to be sent via email invoces that can be paid online. You can mail a money order (sorry no, checks of any kind, cashiers checks, or money orders from banks are accepted) to the maiing address provided. Some people wish to pay through Western Union or Money Gram in an emergency to make an immediate payment. This can be expensive for the client so it is discouraged unless there is an emergency. Call for details. Cash payments may be made in the office. If you have been to court before, been ordered to pay or recieve child support, or have any other paperwork that concerns your issues, have it available. Be ready to send a copy to us if needed when you are getting help from Allied Legal Services. If you are not sure what you need or where to get it, call us and we will help you with that also. If your issues have been dealt with before in court, copies of your case files are normally attainable at the district clerks office in or near the county civil/family court house in the county in which they were filed and heard. Call the courthouse in the county in which the issues were dealt with or call us for help.